They look like real slash pockets, but they aren't usable. A perfect embellishment to complete your garment. Professional looking faux pockets are easier than you think. 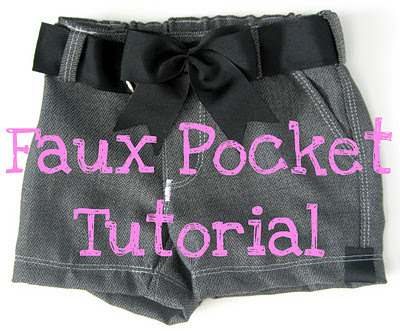 Here is my easy, fool-proof method for altering pants patterns for faux pockets. Shown above using my Essential Pants pattern ... using the short length option, and also adding belt loops. Check out the complete instructions with full color pictures and resources by clicking on the above picture, or HERE. Thanks for the tutorial. The pants look awesome!